Just dropping in to wish you all a Merry Christmas. I hope that you take the time to relax and enjoy this special day with your family and friends. Here's this years photo of my family. We had our annual Christmas Eve Eve dinner last night it was a truly magical night. A special thank you to all my friends! I value your friendship and your support and look forward to more good times together in 2011. Over the last few months I have been creating Advent Calendars for two of my friends .. Francie and Belinda. It's taken so long because I had a trip to hospital and then a couple of complications but am lots better now. I gave the girls their Calendars on Wednesday night so I am now able to share them with you. I'm not going to list the ingredients because as you will see there are way too many. The girls were thrilled with them and so was I. Am actually thinking I might make one for myself next year. 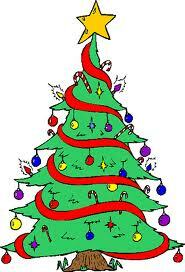 The first three months of Trish's Stamp Club are finished and we are having a break for Christmas. All the girls now have their November orders so I thought I would share the little Christmas present that I made for each of them. and this is packaged and ready to go. I'm not sure if you can see what it is, so let me tell you. I found these gorgeous black and white melamine drink coasters in the kitchen section of Big W and wanted them for my new desk in my new room. BUT I loved them so much I wanted to share them all with the girls in my Stamp Club so then I had to come up with an idea on how to package them. Enter the Scallop Circle Bigz Die. 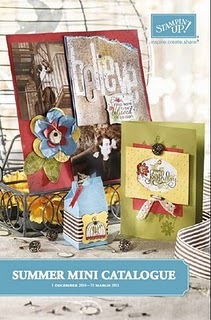 I cut the back circle out of Cherry Cobbler card and the front is cut from the Jolly Holiday DSP. 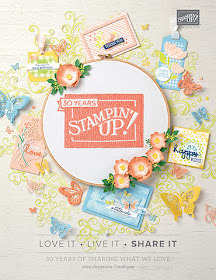 Stamp sets used are Sparkly and Bright, Delightful Decorations and Perfect Punches. I have used the Ornament and Round Tab extra large punches and the tag on the front is from Lots of Tags Sizzlets. Inks are Cherry Cobbler, Old Olive and Basic Black and ribbon is 1/4" Old Olive Grosgrain. My Dad, Leslie Michael Grehan was born on the 27th October 1930 so this year we celebrated his 80th birthday. Dad grew up on a farm in the country town of Ravensbourne just outside of Toowoomba west of Brisbane the second last of ten children. His dad was killed when he was 11 so everyone, had to pitch in and help with the farm from that day on. He reminisces about his youth constantly. All the fun they riding to school on a horse (3 of them), stealing fruit from the other farmers orchards at night, his boarding school days, country dances, moving to the big smoke to go to Uni and then work. My Dad eventually ended up working for Woolworths and we lived all over the place. Our childhood was never boring but I vowed that when I married and had kids, we would live in one place while they were growing up and we have; several houses but always in the same town so they could go to the same school and make life long friends. This was something that I missed out on, but I will always be grateful to Mum and Dad though and the opportunities they gave us. My Dad is now not the tough business man he used to be. He loves spending time with his grandchildren and is now also a great grandfather. He loves his garden and loves to potter about it and my boys are off over there tomorrow to help him dig out a few tree stumps so he can plant something new. When they were little they loved to go the small hobby farm that Mum and Dad had. They loved to help him with the vegie patch, ride the horse and swim in the pool. School holidays spent with Nan and Pop were the best. He has taught them both a lot of skills, that we couldn't teach them. It's nice to see them now all grown up and still loving to go over and help them out. Here they all are together at Dad's Birthday lunch. We went to a little boutique winery in the Gold Coast Hinterland and then back to our house for coffee and cake, speeches and pressies. That's Paul on the left, then Dad, my nephew Nicholas and my other son Jay. Now here is the card that I made for him. The card was in sepia tones but not quite as yellow as it looks here, but it gives it that old country feel I think. 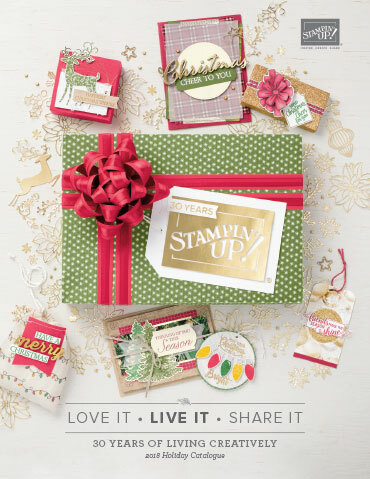 All the shops are having sales in the lead up to Christmas and Stampin' Up! have decided to jump on the band wagon and join in the fun with their December Frenzy Sale. They are offering a selection of products with a discount of up to 50%. Click RIGHT HERE to see what's on offer. There are some great bargains and I will definitely be investing in the Circle Scissors and Teeny Tiny Sentiments is on offer at 50% off. This is a fabulous greeting set and the sayings fit perfectly into the Word Window Punch which layers beautifully onto the Modern Label Punch! But wait ... there's more!!!!! Everything is happening at once today it seems. Christmas is definitely on the way. Now if you want to order anything to arrive in time for Christmas, I will be putting in an order on the 8th December and I have a little Christmas gift for everyone who places any order .. FREE SHIPPING. Contact me to take advantage of this offer.